For a piece of legislation to become an official law in the United States, it must first undergo a long and complex process involving two branches of the government: the legislative and the executive. 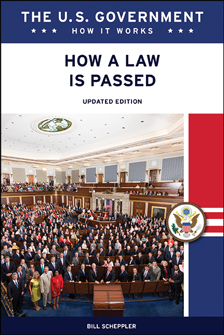 How a Law Is Passed, Updated Edition puts students right where the lawmaking action is by tracking the progress of laws, from proposals in Congress, through debates in the House of Representatives and the Senate, to approval by the president. Readers will also be hooked by this eBook's lively full-color photographs, detailed narrative, informative sidebars, and concise glossary. In depth yet accessible, this eBook is ideal for student research and meets national social studies curriculum standards.